Turkey's president Recep Erdogan and Russia's president Vladimir Putin meet for talks, Aug. 9, 2016. 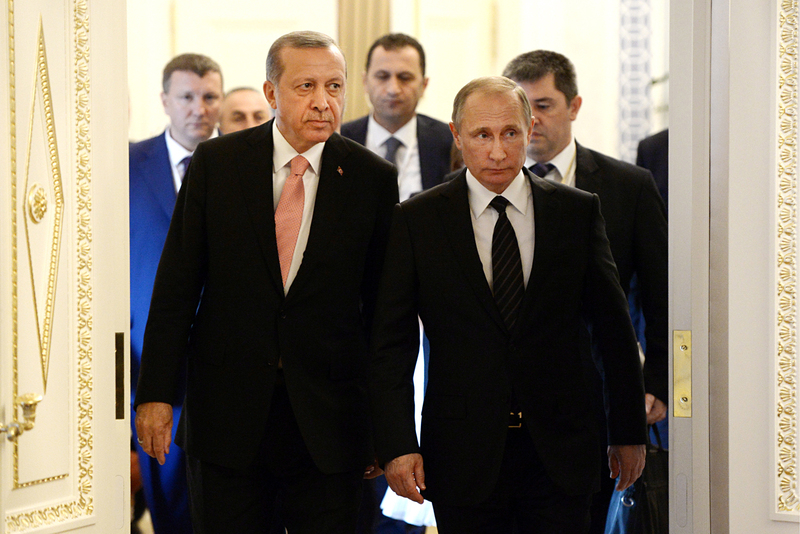 Russian President Vladimir Putin and his Turkish counterpart Recep Tayyip Erdogan have discussed in a phone conversation the situation in Syria, the Kremlin press service said on Aug. 26. The conversation was held at the initiative of the Turkish side. "The leaders had a detailed exchange of views on the situation in Syria. The importance of joint efforts in the fight against terrorism was noted," the Kremlin stressed. Leaders also have discussed bilateral cooperation, Kremlin said. "The discussion concerned further development of Russian-Turkish cooperation in the political, trading and economic spheres in the context of the agreements achieved at their meeting in St. Petersburg on Aug. 9," the Kremlin said. At their meeting in St. Petersburg the two leaders agreed to systematically resume the operation of the main mechanisms of interaction. The Russian and Turkish agencies concerned were instructed to hold a meeting of the joint strategic planning group in the first half of 2017.